There seems to be no shortage of informal, low-key “grassroots” athletic events in Fort Collins for those who like to test their mettle against the clock. For running, there is the Fort Collins Running Club’s Tortoise & Hare races. For cycling, there is the Trident Consulting’s Grass Roots Time Trial Series. Hooray! 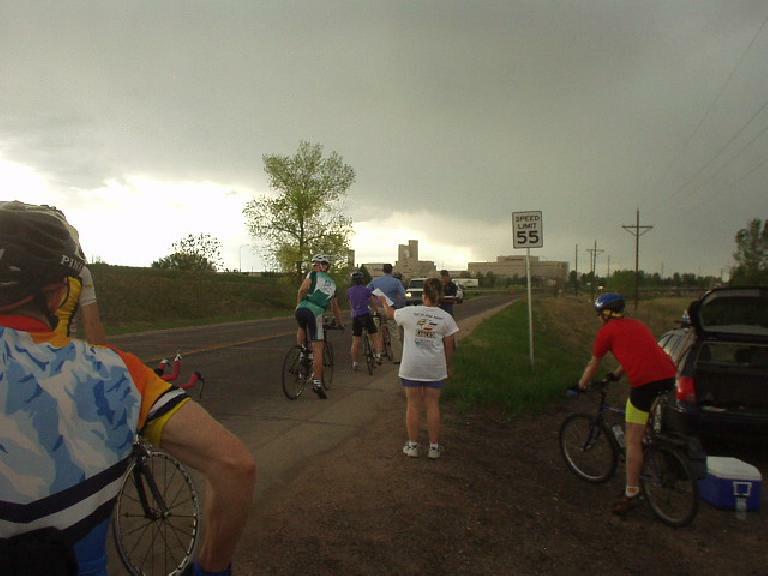 The Grass Roots Time Trial course is out-and-back along the east side of I-25 starting just north of Mountain Vista Drive at ~6:00 on Wednesdays each week in the spring and the fall. Conveniently, this is just 4 miles (and 2 stop signs) away from me. I can bike over there in 15 minutes (less if I time-trialed to the start). Time trials (and hill climbs) are my favorite type of competitive bicycle races to participate in (note that centuries and double centuries are not races per se) because they 1) do not require riding in packs and 2) in contrast to road races that include 60-mph descents and end in bunch sprints—and criteriums where crashes always occur—time trials seem a bit less dangerous. Kind of like autocrossing is for car racing, minus the slalom course. This page will log the Grass Roots Time Trials I do, for future reference. Yes, it’s true… I did not come in last! Though it is pretty hard to be proud of my time at least I caught six people and no one passed me (riders were staggered 1 minute apart), so I had to have finished at least 20th percentile! Of course, two guys (who normally are fast) decided to show up on a mountain bike, including one guy with panniers filled with commute stuff from work. One of these guys started right behind me and I was really hoping he would not catch me. He didn’t! That said the time trial started at a pretty bad time. It was a gorgeous day all day but then some rain clouds rolled in as I biked to the start. In fact, there was lightning. Now the TT course was flat and out-and-back, but some momentary wind gusts that lasted about 5 minutes came in when I was going out. I was in my aerobars and my speed was only 11.3 mph at one point! It died down but we never had an equivalent wind gust on the way back. If I had could have started 15 minutes earlier, my time would have been better. Anyhow considering the non-ideal wind patterns I was happy to get my final average speed up to 20.1. Normally I would think that is pretty slow for 10 miles but at one point (on the way out) my average speed was just 15.6 mph and getting it up over 20 was looking unlikely. Next week I should be able to do better. Conditions this week were just about perfect for a time trial: virtually no wind going north or south, and temperatures in the low 80s. I warmed up adequately and felt like I paced myself well from the get-go. 1st half: 12:15, 2nd half: 12:14, or a virtually perfect split! 9.75 miles in 22:29 translates to 23.9 mph, or the fastest average speed in a time-trial I have ever achieved. I think running really has helped with time-trialing as it helped me get accustomed to breathing hard, fast, and regularly. Diana also had a good time trial considering that over the weekend she did the hilly Auburn Half-Ironman (in which she came in numero uno on the bike and 2nd overall in the women’s open class! ), and hence her legs were tired. She said of all of the Grass Roots TTs she’s done this year, her wattage output was the lowest, and yet she still beat me by 6 seconds. (Then again, she came in 2nd last week, and beat me by 3.5 minutes!) She did give Canny a compliment, however. “Is that bike new?”she inquired. When I replied, “No, 14 years old,” she remarked, “it’s so shiny!” Canny has indeed aged well and today she proved, once again, she can keep up with more modern bicycles. This time I was determined to make this an all-guts race, and go all-out from the very outset. Unsurprisingly this made me start breathing hard very quickly but I really think all the running I have done this year helped me cope with that. The winds going out were a bit stronger than I liked, but I still managed speeds over 22 mph. I was anticipating a tailwind on the way back but the wind seem to have shifted at some point. Anyhow, despite the winds being worst than the last TT I did, elapsed time was only 12 seconds off: 24:41. Was very happy with that. Also am happy I will be back from traveling for the fall time trial series starting in August!